The terrorist group which now goes by the self-proclaimed name the Islamic State, which was formerly known as the Islamic State of Iraq and al-Sham/Syria (ISIS), is seeing mounting support in Lebanon’s second-largest city of Tripoli, despite the lack of organized ISIS elements there. The barometer for measuring this allegiance is the sale throughout Tripoli of ISIS paraphernalia, in the form of the group’s flags and other items such as stickers and headbands, promoting the jihadi terrorist group’s cause. The generally increased appearance of the ISIS-affiliated insignia in the region, which Lebanon’s Daily Star newspaper reports is being donned by protesters at Islamist rallies in the city, lends itself as “a potential signal of the radical group’s growing reach and level of support” in the region. The ISIS flag which has been adopted by the terrorist group as its banner displays the seal of the Prophet Mohammad. 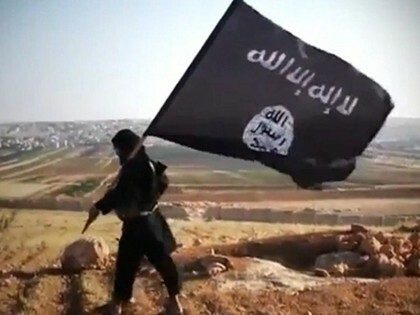 Originally, however, it was used by al Qaeda in the 1990s as that terrorist organization’s flag and has been used over the years by several other terrorist groups, notes the Daily Star. Many ISIS supporters in Tripoli insist that the flag is merely a symbol of their solidarity as it pertains to Sunni unity and pride. The manager of a shop which sells the ISIS flag along with other ISIS-related items – who asked to not be identified – insisted to the Daily Star that the flags were not symbols of terrorism but rather “things from the Prophet [Mohammad]… It’s no different than selling the Brazilian or the German flag,” he said. He noted to the Star that the flag became popular as a symbol of Sunni strength during the ’90s due to the now-deceased bin Laden’s use of it. ISIS and its affiliates (such as al Qaeda) have killed over 300 Sunni Imams and preachers throughout the Middle East and are known for committing mass murders of Sunnis as well as jihadists whom they deem as not being extremist enough. Their wrath continues to gain more traction as supporters, including radicalized Muslim individuals from the West, join forces with the terrorist group.